According to Amiga Power Jens Anderson and Jan Kronquist were the programming team responsible for the second best Amiga game ever. 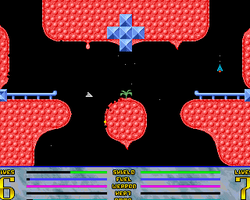 That game was Gravity Power which was released as Cover Disk game for Amiga Power. A big thank you to Lifeschool from the Lemon Amiga forum for again completing some research for the questions marked with a *. *Was the Amiga the first computer you programmed on? Jan: I started out on the ZX Spectrum while Jens was in the Commodore camp on the C64, but both of us were programing basic BASIC at that time. Later we converged on assembly on the Amiga 500, and then later the A1200. *Which games and programmers influenced you? Games such as Speedball 2, Supercars 2 and Alien Breed were great fun. Emerald Mine, a Boulder Dash clone by Kingsoft, deserves special mention -- the dual coop style (sometimes PvP) and most importantly the level designer offered countless hours of fun. Kingsoft of course went on to publish the original Gravity Force soon after, and we played it so much that we started making up additional gameplay constraints such as only being allowed to play with your left hand with the joystick turned upside down. *Did you have anything to do with the original Gravity Force game with Stephen Wenzler? with a new and contrived name. *Did you encounter any hardware or speed issues with the two-player split screen mode? Jens: The split screen was not a big problem thanks to the copper chip of the Amiga, making it easy to switch to a two-player split screen. Much worse was the null-modem linkup option -- more on that later. *There are five separate graphics artists credited for their involvement with the coverdisk version; did you have a big team working on this? Jens: No -- some were friends helping out while some were loosely associated and simply sent us suggested graphics. 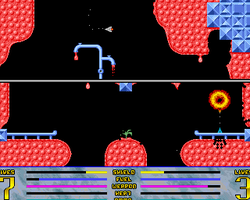 Screen shot taken from Lemon Amiga. 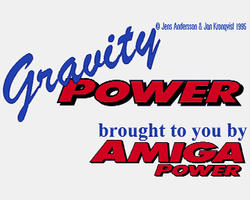 Gravity Power was included as a cover disk on Issue 50 of Amiga Power. A disk image of this cover disk can be obtained from Amiga Magazine Rack website. *Gravity Force 2 used some amazing hardware tricks to produce the sound effects. According to one report, the buzzing engine sound of the rockets is in fact the authors' Startup-sequence used as a sample. The sound when the two ships collide is the sound of a radiator being hit with an extension cord, and the sound of a ship being submerged is taken from an orange dropped in a coffee pot. Is this true? Jan: All true. I had an 8-bit sampler, a tape recorder and we made use of what we had available. When dropping the orange in the coffee pot we had to stand in the bathroom to get the proper echo. *What did you think about the Amiga Power "Second Best Amiga Game Of All Time" review, and how did they go about commissioning their own coverdisk version? configurable default player names). They included their ideas of new weapons and modes, of which we implemented the majority. A 4-player mode was however simply impossible -- the copper chip easily split the screen vertically, but horizontally was a completely different thing. As a side note, the AP staff expected us to be girls based on our names sounding female in English. *How much did you get paid for producing the coverdisk? Jan: We would probably have done it for free, so we were very happy they offered to pay us at all. *Gravity Power features several tweaks from Gravity Force 2, can you tell us what were the main differences between these games? Jens: The Amiga Power team requested a very deadly guided missile, among other special weapons and abilities. It was almost *too* deadly, but when in use it added a certain tension as the players would almost play hide-and-seek since contact typically meant immediate death for the player reacting too slowly. *The Gravity Force games spawned a multitude of clones - some good, some not so good. Have you seen any of these, and what do you feel about kickstarting that whole clone genre? Jan: Quite a few people have contacted us and showed off their work, on a variety of platforms. These have typically been very impressive and made with a lot of love -- we have been very happy to see how others have made their own favourite versions. Among purely commercial games we have not see all that many that have retained the certain feel we liked about Gravity Force, but we also realize that different people value different aspects. We like inertia and lots of shots in the air. Were there any problems or interesting stories during development? 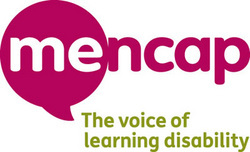 disabled in the linkup mode. The two computers also need to remain synchronized to within 1/50th second -- one frame -- for this to work at all. Was there any interest in converting the game to other machines at the time such as the Atari St? Jan: We were 100% into the Amiga at the time, and did not really consider any other platform. Also, the game was fully in assembler and making use of specific hardware, so a conversion would have meant a full rewrite. After the publicity provided by Amiga Power were there any offers of work from commercial software companies? Jens: No, although at the time we were not looking for that. Both of us wanted to get degrees after finishing high school and only considered game development to be a hobby. Were there any arcade games you would have dearly loved to have converted to the Amiga? Jan: We were actually never big arcade fans, and instead much more into the C64 and ZX Spectrum games. Gravity Power has elements similar to the 8 Bit game Thrust - were there any 8 bit games you were particularly inspired by or wanted to update for the Amiga? Jens: From Thrust, the ability to pick things up was incredibly cool and something we wanted to incorporate in GF2. Lode Runner was great on the C64, especially with its level editor -- I don't remember the later versions being as good as that one. Where there any particular program routines from the game you were most proud of? Jens: Having a huge swarm of shots in the air, maybe especially guided or bouncing shots, make a pretty cool effect even though it's not very complicated. Getting the right combination of thrust, gravity, air resistance and rotational speed parameters was probably the most difficult bit. What was the biggest challenge in finishing the game? Jan: However, the biggest challenge was probably to wrap everything up in a proper game format. It's very easy to get started with a game, but once over the initial threshold of experimenting it's easy to lose the motivation of actually putting it together with game menus, actual graphics and so on. Once all packaged up, it was a nice feeling to be able to release it and share the experience. What happened after Gravity Power? Are you still involved in the business? Jens: Both of us got Comp Sci degrees while we played with the concept of a "Gravity Force 2K" millennium edition for PC, with grappling hooks and various new features. However, it stalled as we got busy with other things. I went on to work for a physics lab in Switzerland and an investment bank in London, and have just resigned to spend more time with my newborn daughter. Jan: I had a few summer jobs as a game developer making mobile phone games, but didn't like the employment conditions with repeated crunch times and instead became a consultant working on enterprise systems promoting agile development using open source tools. However, both of us still enjoy gaming! The current favorite is StarCraft 2. They also have a website dedicated to Gravity Power.